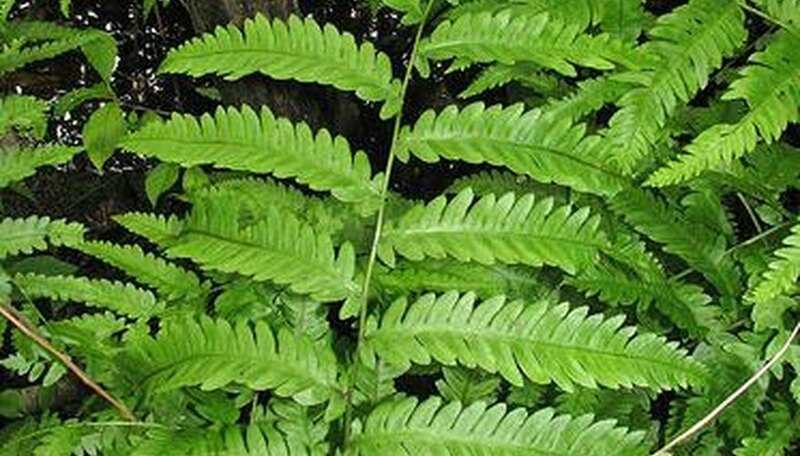 Giant chain ferns (Woodwardia fimbriata) are evergreen ferns that grow to an average height of 6 feet, with plants growing as tall as 9 feet in damp, humid climates. Chain ferns are hardy perennials that are suited to Zones 8 and 9 and require at least five years to achieve their maximum growth potential. An excellent choice for beginners, these ferns are low maintenance, typically requiring nothing more than consistent watering from their caretakers. Determine the fern's placement in the garden. Chain ferns prefer areas that are partially shaded. This particular fern is very hardy and does not necessarily need to be sheltered. Plant your ferns in the spring to optimize their first growing season. Check the bed's soil with a soil test kit. Chain ferns thrive in clay or loamy, well-drained soil that is either slightly acidic or neutral. If the soil seems too dry or lacking in general nutrients, consider adding a pH-balanced topsoil for additional water absorption and retention. Dig a hole in the bed large enough to completely submerge the fern's root system. Remove the plant from its plastic liner and place it gently into the hole, being cautious to avoid damaging the root system. Fill the hole with soil and firmly compress the top layer to ensure a firm planting. Water the fern at least once every day. In the summertime, consider increasing watering if the soil appears dry. Chain ferns thrive in damp soil, as they require a steady absorption of nutrients. Add a topcoat of well-composted manure or leaves around the ferns in late autumn or early winter to maintain soil conditions. Remove older, worn-out fronds from the previous year in the spring, when new fronds start unfurling. Do not fertilize chain ferns, and if nitrogen is added to the soil, the ferns could be damaged.